This webinar, presented by Dr. Alexandra Gerstner from the Canadian office of the DAAD – German Academic Exchange Service, will provide an overview of the German Higher Education landscape, its universities and universities of applied science along with information on opportunities for student exchange, research collaboration and partnerships with German universities. DAAD is Germany’s national agency to foster exchange between Germany’s students, faculty and universities and their counterparts around the world. In Canada, DAAD is represented by the DAAD Information Centre in Toronto. For more information on DAAD, please visit www.daad-canada.ca. Dr. Alexandra Gerstner is the Director of DAAD Information Centre Toronto, a position she has held since 2014. 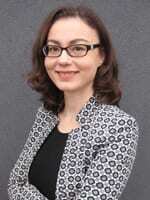 She is also a Visiting Assistant Professor of German and History at the University of Toronto. Prior to that, Dr. Gerstner worked at the DAAD’s head office in Bonn where she oversaw the organization’s worldwide network of Information Centres. From 2007-2010, she was the Director of the DAAD Information Centre in Yerevan, Armenia. Dr. Gerstner holds a PhD in history from the Freie Universität Berlin, a degree which she received in 2007. DAAD is the German national agency for the support of international academic cooperation. DAAD offers programs and funding for students, faculty, researchers and others in higher education, providing financial support to almost 120,000 individuals per year. It also represents the German higher education system abroad, promotes Germany as an academic and research destination, and help build ties between institutions around the world. In Canada, DAAD is represented by its Information Centre in Toronto. This office is responsible for promoting DAAD’s suite of scholarship and grant programs to scholars at all Canadian universities and serves as a first-point of contact for individuals interested in learning more about Germany as a destination for study or research.